Halifax will be looking for their first win of the Super 8s when Leigh Centurions, who got their first success of the Qualifiers with victory over Sheffield last weekend, visit the Shay on Sunday (3.0). 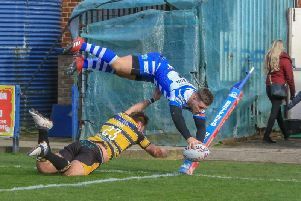 Fax are again expected to be without winger Tommy Saxton, although half back or full back Ben Johnston could make a return after a one week absence. “Leigh are still looking for that Super League place; we’re looking for some form and a first win, so I’d say all the pressure is on them,” said Fax boss Richard Marshall, who will find out on Monday night if he has beaten Leigh boss Paul Rowley to the Coach of the Year crown. “We’ve had a couple of tasty games against them this year and while both results went against us, I think we emerged with plenty of integrity in terms of how we conducted ourselves and how we played the game. “We’re trying to fix ourselves up a bit now while they’re playing pretty well; they looked more like the Leigh of earlier in the season against Sheffield. “The challenge for us is to get the energy and intensity that we had a few weeks ago against Bradford and Widnes back into our game.